Yes, this is a shameless ploy to get traffic through exploitation of my cute puppy, but I’m sure if Beaffin could understand computers he would be happy being a blog star. 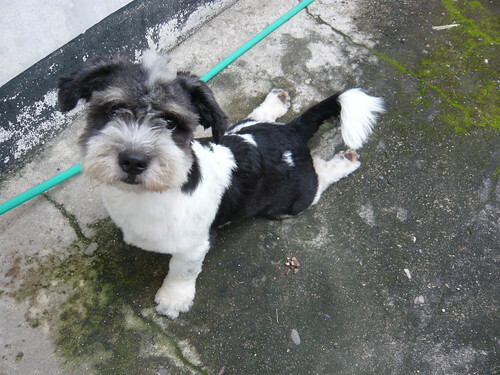 He is quite cute in the Bhujangasana position, don’t you think? His “warrior pose” recently made it on the “cutest puppy” blog here. Written by: Farmer Jack on May 22, 2013. This entry was posted in beauty, Canines, puppy, yoga and tagged Beaffin, cute puppy, cutest puppy, puppies, yoga by Farmer Jack. Bookmark the permalink. I garden for beauty and because it tastes better. Because everyone loves a puppy doing yoga is licensed by Urban Micro Garden under a Creative Commons Attribution-Noncommercial-Share Alike 3.0 United States License.